AUDI A1 - The Audi A1 (internally designated Typ 8X) is a supermini sized economical car launched by Audi at the 2010 Geneva Motor Show. Sales of the initial three door A1 model started in Germany in August 2010, with the United Kingdom following in November 2010. A five-door version, called Sportback, was launched in November 2011, with sales starting in export markets during spring 2012. The new e-tron model series from Audi will gain another new member at the Geneva Motor Show: The Audi A1 e-tron is a Mega City Vehicle (MCV) with an innovative drive technology. It comes equipped with a powerful electric motor for zero-emission driving in the city. There is also an internal combustion engine on board that recharges the battery in exceptional circumstances. 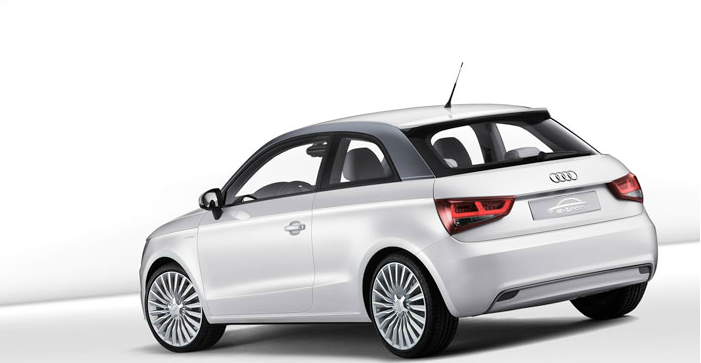 The AUDI A1 e-tron is very agile thanks to the 75 kW (102 hp) peak power of its electric motor. The e-tron model family from Audi is just a few months old, but it already has a number of members, for each of which Audi has chosen a different drive technology. The first e-tron, which debuted at the 2009 IAA in Frankfurt/Main, is a near-series high-performance sports car with electric motors for all four wheels. The study shown at the Detroit Motor Show in 2010 is a lightweight, compact two-seater with two electric motors on the rear axle. 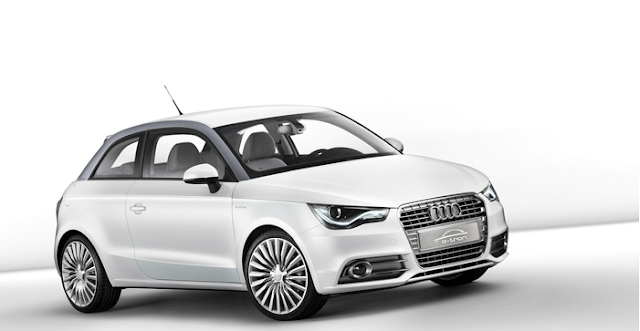 The AUDI A1 e-tron now presents another approach – a compact electric car in the premium class. The four-passenger, two-door MCV city car was designed specifically for use in the metropolitan areas of Europe and North America and in the rapidly growing megacities of Asia and South America. The Audi A1 e-tron always drives on electric power; its internal combustion engine is only used to recharge the battery in isolated cases. The synchronous electric motor of the Audi A1 e-tron is mounted transversely at the front of the car. Its low mounting position has a positive effect on the vehicle’s center of gravity. Continuous output is rated at 45 kW (61 hp), with peak power of 75 kW (102 hp) available in short bursts. 150 Nm (110.63 lb-ft) of torque is continuously available, and peak torque is 240 Nm (177.01 lb-ft). The electric motor sends its power to the front wheels via a single-speed transmission. The elegant, retractable selector lever on the console of the center tunnel used to choose between “Drive,” “Reverse,” and “Neutral” was taken from the first Audi e-tron. The power electronics are mounted in the engine compartment above the electric motor. The most important components are the pulse-controlled inverter, which serves as the controller between the electric motor and the battery; the DC converter, which connects the high-voltage network with the 14 volt electrical system; a breaker unit to protect the high-voltage components; and the charging module. The socket for the standard charging plug is located behind the rings in the single-frame grille of the Audi A1 e-tron. A fully depleted battery can be recharged in approximately three hours from the 380 volt grid. A display immediately adjacent to the plug-in connection shows the current charge status and the charging time remaining. The concept of the innovative Mega City Vehicle requires the electrification of key auxiliaries. The refrigerant compressor of the climate control system, for example, is electrically powered by a high-voltage electric motor that supplies only the amount of power needed at the time. This increases system efficiency substantially compared to conventional concepts. Thanks to a special circuit, the climate control loop also functions as a heat pump that regulates the temperature of the cabin and the battery. 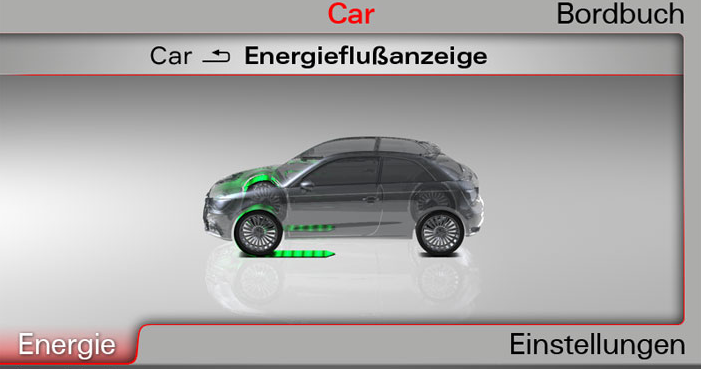 The power steering of the Audi A1 e-tron is electro-mechanical and thus particularly energy-efficient. An electronic brake system makes it possible to tap into the recuperation potential of the electric motors. A hydraulic fixed-caliper brake is mounted on the front axle, with two novel electrically-actuated floating-caliper brakes mounted on the rear axle. These floating calipers are actuated not by any mechanical or hydraulic transfer elements, but rather by wire (“brake by wire”). In addition, this eliminates frictional losses due to residual slip when the brakes are not being applied. In addition, the servo unit received a new, demand-controlled electric vacuum pump. The energy storage unit is arranged below the floor, where it is ideal for the center of gravity and weight distribution. The battery pack is shaped like a T, with the short “transverse beam” filling the rear section of the center tunnel and the “cross-beam” filling that area in front of the rear axle where the fuel tank is otherwise located. The 380 volt lithium-ion rechargeable battery has a nominal energy content of 12 kilowatt hours. It comprises 96 prismatic cells and weighs less than 150 kilograms (330.69 lb). The Audi A1 e-tron can drive 50 kilometers (31.07 miles) emission-free in city traffic on the powerful battery. On longer trips, the battery is recharged by a particularly compact internal combustion engine mounted below the luggage compartment. The A1 e-tron concept car has a Wankel engine as a range extender, but other compact concepts are also possible. The small single-rotor Wankel has a chamber volume of 254 cc and runs at a constant 5,000 rpm in its peak efficiency window. The electronics also consider navigation data such as the destination and route profile to automatically activate the range extender as needed. The driver can also turn the range extender on and off as necessary with the push of a button The fuel tank holds 12 liters (3.17 US gallons). The great strengths of the Wankel engine are the nearly vibration-free and quiet operation, the small dimensions, and the extremely low weight. Together with the generator, which is powered by the Wankel engine and produces 15 kW of electric power, the complete assembly weighs only around 70 kilograms (154.32 lb). This weight also includes the special power electronics, the intake, exhaust, and cooling unit, plus the insulation and the subframe. The first defining impression that the driver of the Audi A1 e-tron gets is that of nearly total silence. Even the Wankel engine in the back can barely be heard when it is running. The second characteristic perception is the power of the electric motor, nearly all of which is available instantly and thrusts the Audi A1 e-tron forward with authority. The innovative Mega City Vehicle, which despite its complex drive technology weighs only 1,190 kilograms (2,623.50 lb) delivers zero-emission driving fun in a modern and sophisticated manner. The vehicle accelerates from 0 to 100 km/h (62.14 mph) in 10.2 seconds and has a top speed of more than 130 km/h (80.78 mph). The Audi A1 e-tron can also cover longer distances if the range extender charges the battery. The extra range, which is intended primarily for interurban driving, is 200 kilometers (124.27 miles). According to the draft standard, the two different operating modes yield a fuel consumption of only 1.9 l/100 km (123.80 US mpg), which corresponds to CO2 emissions of 45 g/km (72.42 g/mile). In electric mode, there are zero local CO2 emissions - the compact A1 e-tron is thus ecological and economical. The concept car in Geneva has a special “Aqua Mint, pearl effect” paint finish; the contrasting roof arch is offset in “High Gloss Steel dark.” As with the other two e-tron models, the 18-inch wheels with a 20-spoke turbine design convey the high-tech aspiration of the concept. The rear diffuser with aluminum trim lacks tailpipes. This emphasizes the width of the vehicle and suggests the low emissions. The two front fenders are emblazoned with the “e-tron” logo. The “Aqua Mint, pearl effect” exterior color carries over into the interior, where it adorns the door panels and the center console. The shift lever is a special leather-wrapped design; as is typical for the e-tron models, the start-stop button was placed in the front of the center console. A specially designed battery cover at the front of the car and the range extender engine with its cooling fins displayed under a sheet of glass in the luggage compartment also serve to visually underscore the clean technology of the A1 e-tron. And because an innovative drive concept also calls for innovative information management, the concept car features a freely programmable instrument cluster with a virtual display surface and innovative display and operating concept. 0 Response to "AUDI A1 - E-Tron"